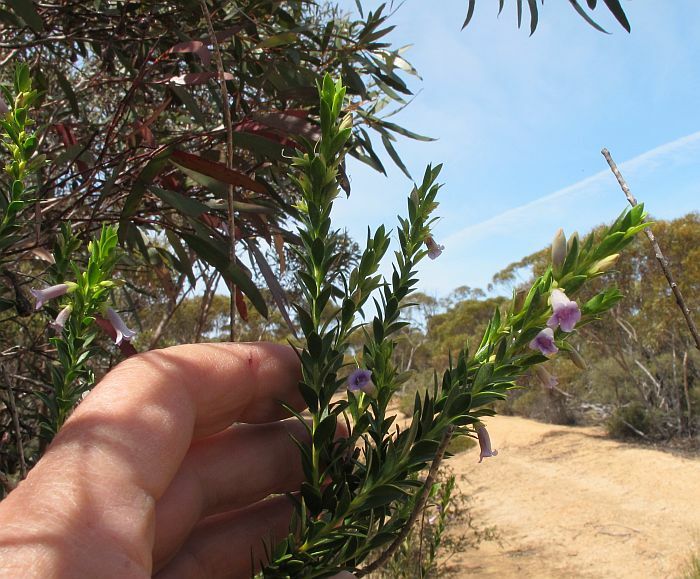 The Eremophila or Emu Bushes were contained within the Myoporaceae family, but in WA and elsewhere, have now been placed into Scrophulariaceae. There are a great many Eremophila species (in excess of 200), with the vast majority found in Western Australia and most of these occurring in remote regions so consequently are not endangered. 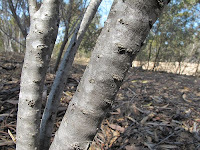 However for those species closer to human occupation and clearing due to farming activities, this is not necessarily the situation. Eremophila lactea is gazetted Declared Rare Flora, which means it is regarded as threatened flora that is endangered and vulnerable. 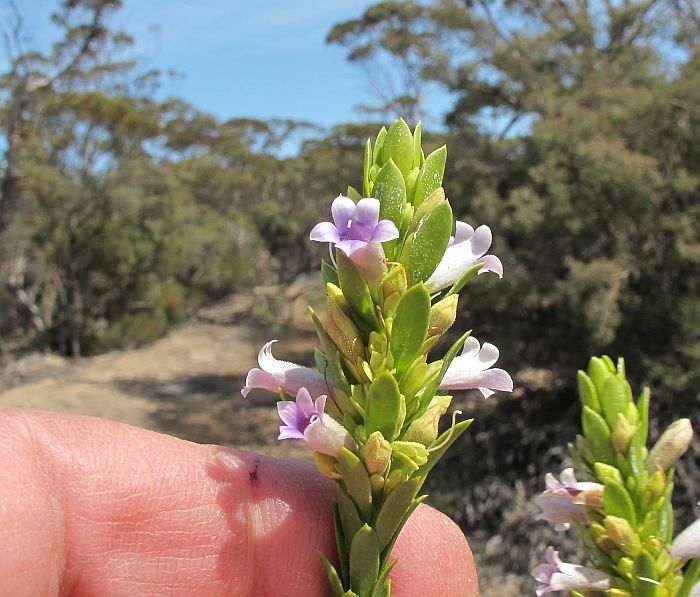 It is known only from small roadside locations west of Grasspatch 70 km (45 miles) WNW of Esperance, which is surrounded by cleared farmland (broad-acre wheat growing area), fortunately it is a low rainfall region therefore weed growth is not a problem. 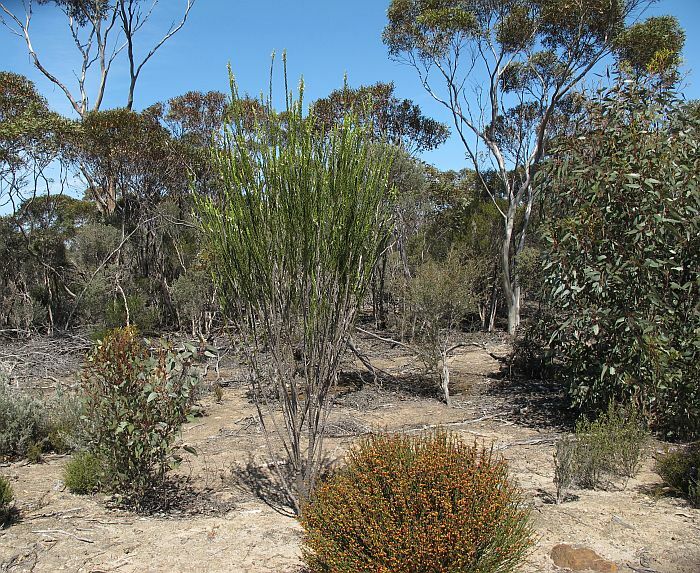 Soils are typical for mallee environments, being a fine sand/clay loam over limestone. 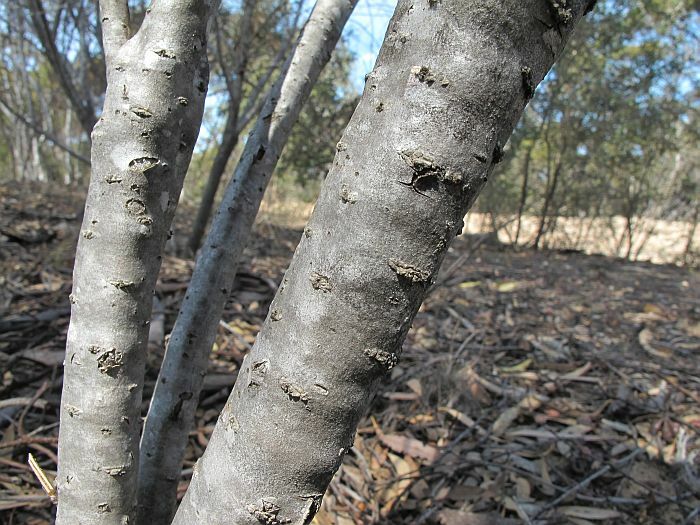 When I was there in 2011, I saw around 20 plants on both sides of the road, but considerably more had died leaving only leafless skeletons. 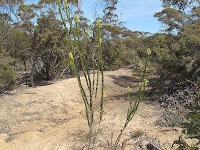 Most live plants were growing in road drainage channels and the inside curve of the road where large trees/shrubs were set further back and where roadside drainage would collect. 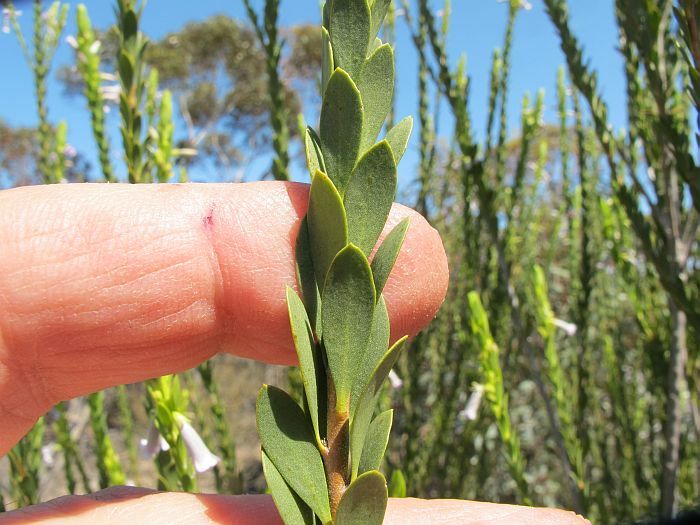 This suggests to me that the mature mallee eucalypts and/or large Melaleuca shrubs are taking most of the moisture and in dry periods any Eremophila lactea growing within their root zone are unlikely to survive. 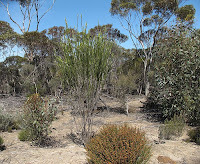 Shrubs growing under mature mallee are usually short-lived, but do very well for several years after a bushfire and before the Eucalyptus/large shrubs begin to dominate. 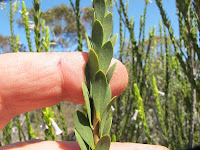 Another indication of this situation is the spindly upright growth, which was the case with most plants seen; the only bushier ones were growing away from the larger vegetation and in a drainage zone. 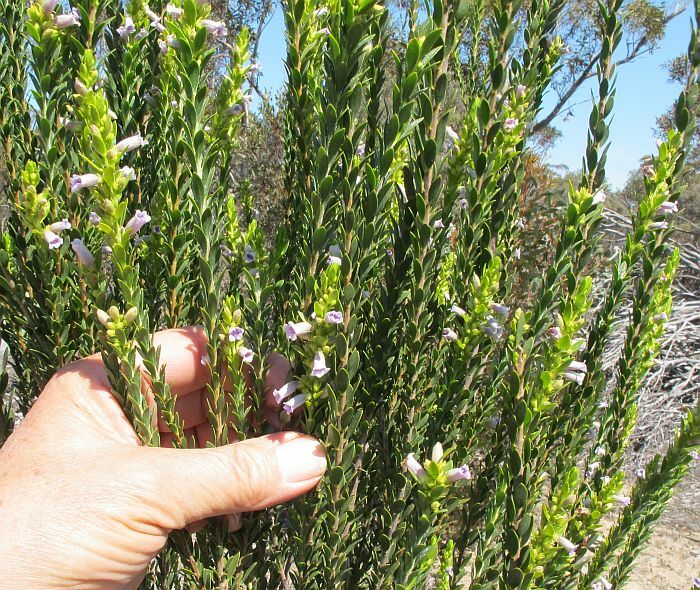 The tallest shrubs were around 2.5 metres (8’) in height, but have been noted growing a metre taller; branches were distinctly upright, but a weeping habit apparently develops with age. 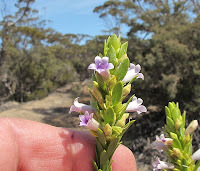 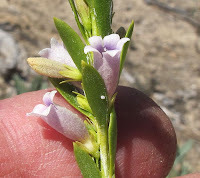 The species name of Eremophila lactea is taken from a white milky substance deposited on the leaves and stems. Flowers are a little under 1.5 cm (1/2”) in length and are recorded in bloom from September to November. 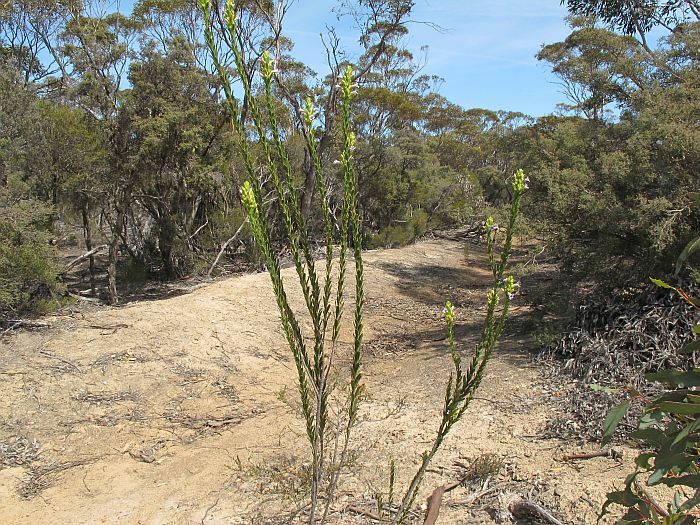 Reference: Nuytsia – Vol.5 – No.3 - 1986.